Chart.js helps you to present your data into 7 different types of charts. With this library, you can create line charts, bar charts, radar charts, polar charts, pie, and doughnut charts. Chart.js displays charts and graphs using the HTML5 canvas element and is supported in all modern browsers. Chart.js is fully responsive, scaling to the size of your visitors’ screens. It also calculates the optimal scale granularity for the size of the chart or graph. By using the canvas element, charts and graphs created with Chart.js are animated and highly customizable. Chart.js also gives your users the capability of interacting with the charts and graphs. It provides support canvas tool tips on a user’s hover/touch of part of the graph, instead of simply generating a static image. The chart.js library does not depend on any other libraries and is very lightweight. The library in total (6 core charts) are only 11.01 kb when compressed. It is modular – its parts can be used and implemented independently – and the code for each of the chart types can be split up. This enables you to load only the code for the chart types you need for your project. Chart.js is available via GitHub. A well-explained tutorial, this article details how to make a line chart, a pie chart, and a bar chart with Chart.js. The code is clean and understandable, and the text does a good job of explaining what the code does. This Chart.js tutorial is detailed and well explained. It shows how to create a doughnut graph, a line graph, and a radar graph, as well as explains a bit about how Chart.js works. This tutorial does a good job of explaining the code used additional to Chart.js, such as defining labels for the doughnut graph. This article introduces Chart.js and briefly explains how to create a simple bar graph. It also gives a brief explanation of how Chart.js works and how to add it to a webpage. This relatively straightforward tutorial explains a practical example of how Chart.js can be used. The tutorial, from June 2013, creates a simple graph of website rankings from Alexa. The code is bulky, but it is understandable and builds a useful graph. This brief tutorial explains how to quickly create a line chart in Chart.js. The code is simple and the each part is explained. This tutorial on Web Designer Magazine shows how to work with Chart.js, dynamically adding, resizing, and changing both data and graphs. 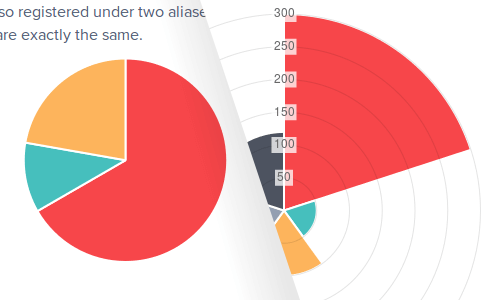 The tutorial briefly explains how to build line, bar, and pie charts. While the article provides only brief explanation of the code, it does show how to work on more advanced uses of Chart.js. This simple tutorial shows how to quickly create a line graph using Chart.js. Each part of the code is briefly explained, creating the final graph.